Are you running Facebook ad campaigns to increase engagement? Wondering how to measure the short and long term impact? When you spend money on an ad campaign with the goal of increasing long term engagement with your audience rather than immediate sales, the results can be difficult to quantify. In this article you’ll discover how to measure and analyze the Social ROI for your Facebook ads so you can assess their value to your business and know which ads are worth running again. Why Track Social ROI on Facebook Ads? The results of social campaigns are just as crucial as traditional ROI. Traditional conversion ad campaigns on Facebook are relatively straightforward. 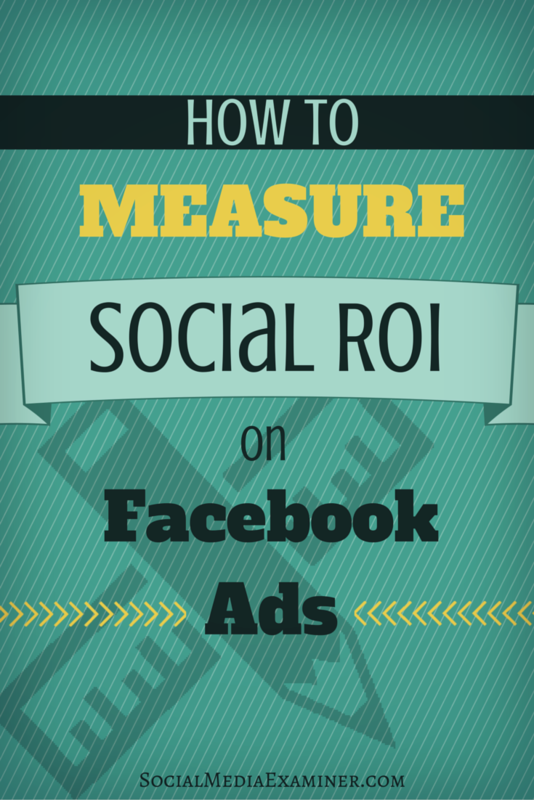 Discover how to measure the social ROI of Facebook ads. For example, let’s say you paid $10 per day for three days of ads, which resulted in 12 conversions of an ebook that resulted in $1,200 in sales. After the campaign, you evaluate the results to determine whether that campaign was successful and you received enough benefit from your investment. You then rerun campaigns with strong ROI and eliminate or alter the weaker ones. Facebook ad campaigns with the objective of engagement should be measured and evaluated the same way as campaigns that bring in sales. Track your social ROI to determine if the number of likes you got from a campaign were worth the amount of money you spent on them. Plus, decide if that campaign had enough value to run again. Keep in mind that the financial benefits of social campaigns may sometimes be less clear. You are after all building long-term relationships with your audience with the goal of future sales. 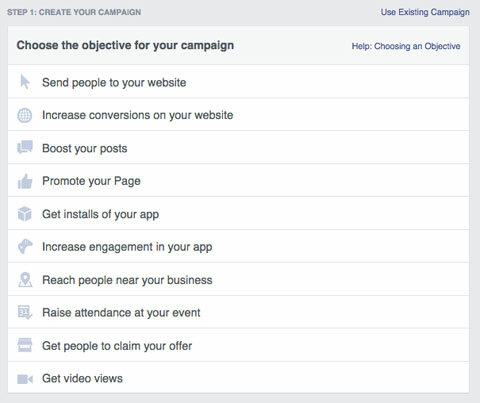 When you create a Facebook ad campaign, start by selecting an objective, which is also an action. Objectives range from clicks to a website to app downloads to Facebook likes, as well as other types of engagement. Choose a measurable Facebook ad objective. Then use tools such as Facebook Insights and Google Analytics to track these actions and evaluate their social impact. The key to tracking social ROI on your Facebook ads is Facebook Insights, a free tool accessible by all admins on your page. Insights are located at the top of the page in between the Settings and Activity tabs. Facebook Insights tell you a lot about the social impact of your campaigns. They include detailed numbers that explain what’s happening on your Facebook page, such as how many likes you received in a week (and how that number compares to the week before) and engagement (likes, shares, comments) on individual posts. 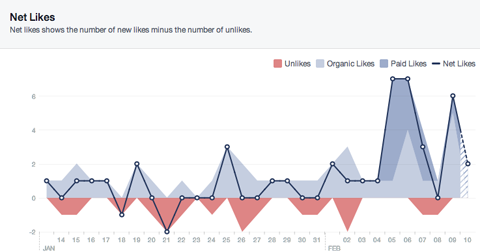 Through Insights, review which of your recent likes were organic and which came from ad campaigns. Then compare paid likes to the campaigns happening at the time to evaluate their contribution to new likes—thus, their social ROI value. It’s easy to spot the promoted posts that were run under an ad campaign; views and engagement are much higher. In addition to campaigns for likes, Facebook Insights will show you how much paid reach from boosted and promoted posts you have, as opposed to organic reach. Under the Posts tab in Insights, view all of your posts and their individual stats on reach and number of post clicks, likes, shares and comments. Insights will let you see exactly how much traffic is paid versus organic. Click on the post itself to get detailed information about its engagement and reach. 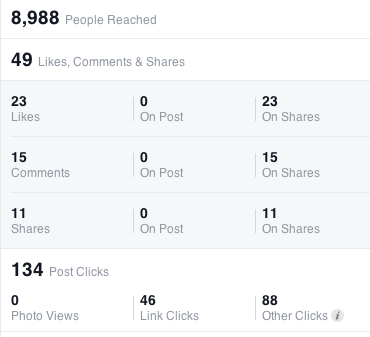 Check out an individual post’s stats by clicking on it in Facebook Insights. Compare the impact of your ads to the money you invested to evaluate the social ROI. For example, if you spent $10 and received 245 likes (245 divided by 10), you basically received 24.5 likes per dollar. Was it worth it? When you evaluate your paid likes, reach and engagement versus what you accrue organically, you’re able to determine which campaigns were most effective, assess the amount of social impact from them and plan properly for future marketing efforts. While Facebook Insights explain the bulk of what you need to know about your social ROI from Facebook ad campaigns, Google Analytics shares how social engagement directly impacts your business off of Facebook. When users interact with a Facebook ad and then travel to your website, it’s another form of social ROI to measure and analyze. Use Google Analytics URL tagging to track individual ad campaigns back to your site. Build tags directly from Facebook and then view the traffic on Google Analytics. 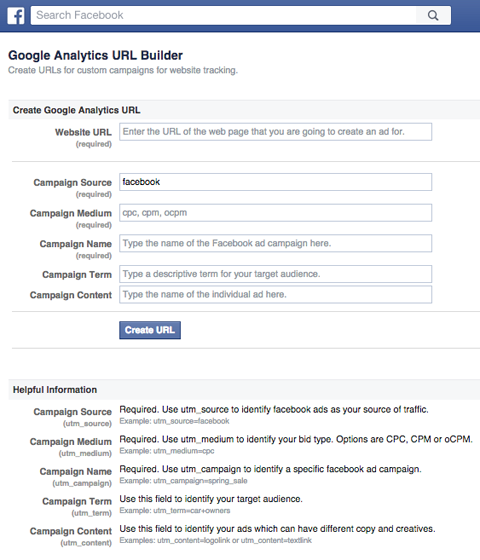 Use the Facebook URL builder to create trackable links. Open Google Analytics, go to Acquisition > All Traffic > Source/Medium to see the origin of your website visitors. You will see how many users arrived on your website from your Facebook page or Facebook in general, which helps evaluate the social impact of your page. Plus, you can actually see how long the users who came from your tagged CPC campaign stayed on your site and whether they visited other pages. Set up URL tracking tags. Then evaluate their results, as well as the origins of other traffic, on Google Analytics. Engagement on your site and blog is just as important, if not more so, than the engagement on your Facebook posts. Track social ROI and its long-term effects using Google Analytics. Go through your sales cycle from Facebook to website visits to sales to determine if the money spent on Facebook ads was a good investment. Tracking social ROI on your Facebook ad campaigns is just as important as measuring financial ROI, especially since the likes that you’re getting on your page can ultimately convert to paying customers. Use tools such as Facebook Insights and Google Analytics to accurately assess the success and value of your social campaigns. Then evaluate the campaigns to determine the best course of action for Facebook ads in the future. What do you think? Do you run Facebook ads? What social stats do you measure? How do you measure and analyze social ROI? How does your social ROI impact your business? Please share your thoughts and experiences in the comments. 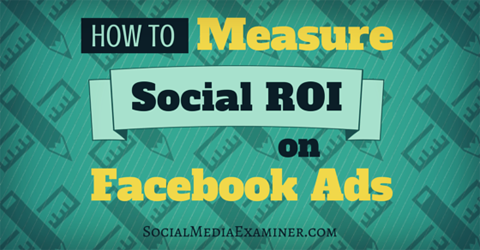 Tips for measuring the social ROI of your Facebook ads.